JS twin shaft concrete mixer has strong mixing power, good mixing quality and strong mixing power, which is a hot product of Aimix Group. 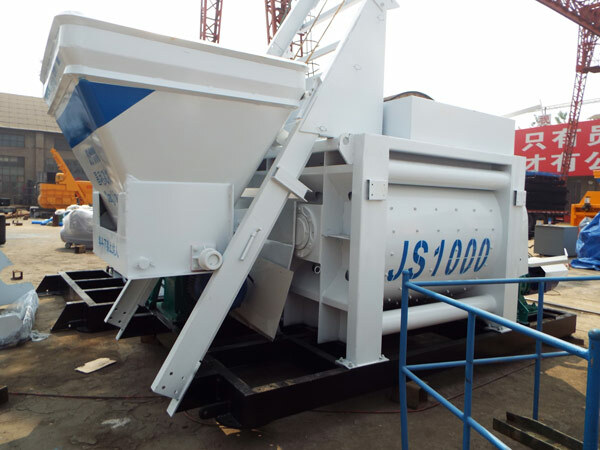 In order to help users operate the mixer well, we will list the basic installation and test running tips of our JS twin shaft concrete mixer. The JS twin shaft concrete mixer should be installed on a flat site, and the legs of the mixer to should be put on hard concrete foundations. The pit should be higher than the ground to avoid that the water may flow into the pit. Users should lift the mixer with a crane, and then install the leg, ladder and slide. Users should keep the rack in the same level, and the track may not be skewed and dislocated by improper installation procedures. Check the gear box and the lubrication condition of concrete mixer. Check the power supply voltage of concrete mixer, and the rated voltage should be 380 volts, and the error should be within 5 percent. Check the connection of motor and electrical components, and the distribution box shell must be reliably connected with the ground. All pipelines should be properly placed to prevent crushing or bumps caused by accidents. Check the connection bolts of various parts of the mixer, especially the moving parts, and users should timely tighten it if loose. Start the mixer motor, and the rotation direction of mixing shafts should be consistent with the direction of the signs. Users should change the power wiring if the direction is wrong. Start the coil motor lifting hopper, and check whether the hopper lifting process and the upper and lower limits are reliable or not. Test the discharging door, and opening and closing of discharging door should be accurate. Turn the water pump motor on, and check the rotation direction of the water pump carefully.